I can’t locate the actual number, but I was told that Obama broke the record for a speaking fee. According to sources, Obama gave a speech in Italy for the tidy sum of $3,000,000. If this is indeed the case, that’s much more than even the crooked Clinton’s got. Bernie Sanders wanted the transcripts from her speeches, but he sold out. Thankfully we finally get a glimpse of the crooked nature of Clintons by way of hackers. Lord knows Ms. Transparency wasn’t going to do it. Further, I wrote this of the Clintons when it was revealed how much money they had stolen from Haiti. The Clintons run a racket. Democrats know this, and they condone it. Charity provides cover for the misdeeds, and “get rich quick” process of the Left. The scheme works by the Clintons donating 10 percent of the funds raised by the “charity.” 10 percent, though a meager amount, keeps scrutiny off the Clintons. After all, at least they give something away. We should forget that 90 percent goes to the Clintons’ personal slush fund. And Barack Obama watched masters at work, and he’s now taken fleecing the world to a new level. Here is what was sent to me about Obama’s “pay” for his speech, as well as stats. Obama talks about himself 216 times during $3 MILLION Italy speech in the course of 100 minutes. 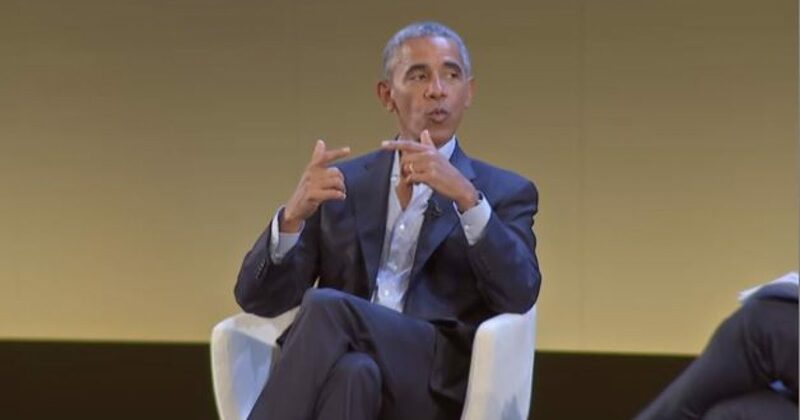 If the organizers of the Global Food Innovation Summit paid Barack Obama a reported $3,000,000 to talk about himself, then they definitely got their money’s worth. Obama said “I” 168 times, “me” or “my” 40 times, and “we,” “us” or “our” referring to his family 8 times. What’s most scary about Obama is the world will take him seriously. Despite Obama’s record, you can bet that he will travel the globe with his misinformation. His nonsense on global climate change and Leftism is what the world wants to hear. Just because we exposed the man as a failure in America doesn’t mean the world won’t attempt to use him (and his blackness) for its nefarious needs. Leftists in America aren’t the only people who depend on Obama being seen as a success. All the failing socialist countries around the world share equally in his failures. He represented the bold experiment in socialism where a country had almost unlimited resources. And socialism failed again.